The second remarkable feature of this novel is that all its major characters are beautifully and imaginatively drawn. Em and Teo, as non-traditional siblings and creative soul mates, come fully alive, Teo as the super-smart, quiet, reflective boy, who can make himself almost invisible, and Em as the impetuous and flamboyant girl, exceptionally gifted in her own tomboyish ways. Even in the midst of the most unlikely events, Teo and Em’s characters make full emotional sense to the reader. The friendship between Rhoda and Delia, whose spirit is an inspiration to all of them, is mirrored in that between Em and Teo, giving both relationships extra depth and power. The novel’s other characters include Rhoda’s close Ethiopian friend Sindiku, a nurse who cares for the victims of Italian mustard gas bombs; the old Ethiopian priest Habte Sadek, keeper of some of the most sacred Ethiopian objects of devotion, and the flamboyant African American pilot in Haile Selassie’s service, Horatio Augustus (based on the person of Hubert Julian, who in real life indeed crashed the Emperor’s private plane in a rehearsal of the coronation ceremony). Wein’s story and characters reveal the destructive power of institutional racism (differently configured, of course) in both the U.S. and Ethiopia, as well as that of colonial aggression and occupation. Individuals cannot fully escape such structures of inequality, Wein’s story suggests. However, they are, at the same time, not fully determined by them and their choices and actions make a real difference resisting and overcoming injustice. This, together with the taken-for-granted, enjoyable, feminism of the characters, makes this an uplifting story. The novel’s form is a third remarkable feature of this novel, for it allows Em and Teo to tell the whole story through their own writings and in their own voices. 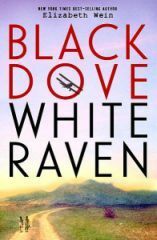 These writings include compositions written as homework for their homeschool teacher in Ethiopia and, later, for Em’s mother; diary-like flight logs of their training as pilots, and even fantasy adventure stories (fiction within fiction) in which Teo and Em imagine themselves as the heroic protagonists “Black Dove” and “White Raven.” These fantasy stories, including, for example, “Episode from ‘The Land of Glass,’” (pp. 222-223), and are so imaginative, whimsical, and rich in metaphor that one could love this novel for them alone. Finally, the image of Ethiopia that emerges from Teo and Em’s descriptions is stunning and rich. The reader can smell the warm, dusty, and smoky air of Addis Ababa by night as the two teenagers walk through the city on their way to Teo’s uncle; and we can see the flat and bare mountain tops, the green and fertile valleys, and the isolated mountain monasteries, as the two young pilots fly their small plane high above it all. Like the Ethiopian landscape, Ethiopian characters such as the bodyguard of a feudal lord, the Ethiopian staff of a small rural clinic, the abbot of a monastery built into a set of caves, the feudal lord in a mountain stronghold, and the Emperor himself, are beautifully and respectfully drawn with a sharp eye for the concrete and the everyday as they impact senses and sentiment. This reviewer found the form of book’s beginning (respectively, a flight log including a letter to Emperor Haile Selassie by Em, a brief episode of an imaginary adventure story by Teo, and a homework composition by Em) structurally too complex and somewhat off-putting. This might discourage any reader, let alone a young one. However, whoever perseveres beyond the first pages, whether one is 15 or 65 years old, will enjoy this imaginative novel and learn much on the way. Elizabeth Wein is the author of two other highly acclaimed and prize-winning historical novels for young adults, Code Name Verity (2012) and Rose Under Fire (2013), both set in World War II.